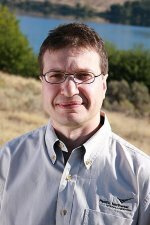 Dr. Alexandre Tartakovsky, a computational mathematician at Pacific Northwest National Laboratory, has been selected to receive an Early Career Research Program award from the Department of Energy's Office of Science. The program provides funding for projects based on proposals submitted by researchers. A total of 65 recipients were selected from the approximately 1,150 submissions received. Tartakovsky's proposal "New Dimension Reduction Methods and Scalable Algorithms for Multi-Scale Nonlinear Phenomena" will be funded at a total of $2.5 million over five years. The project will focus on developing new multiscale methods to improve the accuracy and efficiency of computational models in a wide variety of scientific applications. The DOE program supports the development of individual research programs of outstanding scientists early in their careers and provides incentive for scientists to focus on mission research areas that are a high priority for the Department of Energy, such as biology, computing, energy, and physics. Tartakovsky's project was selected under the Advanced Scientific Computing Research program area within DOE. Tartakovsky joined PNNL in 2004. He received his doctorate from the University of Arizona in 2002 and completed a two-year, post-doctoral research program at Idaho National Laboratory before joining PNNL. He was recognized with a 2008 Presidential Early Career Award for Scientists and Engineers, the highest honor given by the U.S. government to scientists and engineers who are at the start of their careers.